The 5-year Ph.D. with M.S. degree program is for students without a master’s degree from another program. Students opting to continue from the M.S. to the Ph.D. must submit an intent-to-continue form with three faculty letters of recommendation in October of their second year. The faculty reviews these materials by early November and approves continuation in the Ph.D. program. If a student is approved for continuation in the Ph.D. program, he or she must take the doctoral qualifying exam. A committee from three of the four fields of geography and appointed by the Graduate Program Officer will administer the doctoral qualifying exam to students admitted to the Ph.D. program. The doctoral qualifying exam can take place any time during the second year of the five-year Ph.D. program, but students typically take it during spring semester. (2) The M.S. paper option, which requires completion of 35 graduate credits and a research paper during the first four semesters of study; the master’s research paper must be submitted to a scholarly journal upon completion of the M.S. The master’s program committee is not the same as the doctoral candidacy committee. The master’s program committee consists of an advisor and a second and third reader. Unlike the M.S.-only degree program, all three members of the M.S. 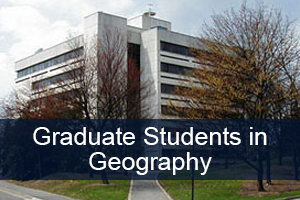 committee in the five-year Ph.D. program must be members of the Geography Graduate Faculty. The student will work with this committee throughout the master’s portion of the five-year Ph.D. program. (2) approve the M.S. degree but do not approve continuation into the Ph.D. program. Students in the five-year Ph.D. program complete a comprehensive exam and defend their dissertation proposal in the third year. Depending on the needs of their research, and in agreement with their doctoral committee, students can fulfill these two requirements in either order. Once students have successfully passed their comprehensive exam and defended their proposal, they typically take two years to research, write, and defend their dissertations. Our online Graduate Student Handbook explains the requirements for all degree programs.